I’ve done quite a few of these little beasts so thought I’d share my final solution. Easy to strip down as there’s no valve gear/cylinders etc, just remove the tiny screw that holds on the linkage off the centre driver on the right. 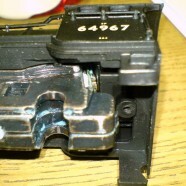 undo the two screws underneath and prise off the plastic cover plate from the rear – Wheelset drops out. Just 3 more screws and it comes apart. Reassembly is another thing with this model! Remove the motor and the little springs/pads. I use a TCS-M1 as with most split chassis these days, cut approx 25mm off the end of the orange and grey wires. Now the first bit of J39 specific messing around. There’s very little room forward of the motor for heatshrink over the terminals so cut the ends off the motor terminals across the little hole in the end shortening the tag. Cut a very short bit of heatshrink, only long enough to JUST cover the final soldered joint. Trim the wires so that they are soldered right up to the end of the shortened tag. The intention is that the finished insulated connections are no longer than the original tag. This ensures that the chassis halves will fit back together as they did before. Later chassis also have some small projections on the lower contact spring mounting that also need to be removed as they prevent the insulated joint from seating properly. The decoder is sticky padded to the bottom rear of the chassis once it’s back together. There is just enough room to squeeze the body back on, it’s tight though, although once assembled there is more room for the decoder than you think. These chassis are quite rough and an extended running in session might be needed to get smooth running once reassembled. Clean all gunge off the bearings and axles, check for loose wheels on insulators and fix with Cyano if needed. Apply a tiny smear of fresh plastic friendly grease to the bearings and gears and reassemble. Wheels will need to be spotless as it’s only got 3 axles for power pickup.